HUD Brightness Knob - this is the knob marked SYM in the upper left corner of the ICP. It is used to control the brightness of the HUD - clicking on the knob increases the brightness, and right clicking on it decreases the brightness. A-A and A-G Buttons - these buttons are used to control the master mode of the aircraft. Pressing either button when the aircraft is in NAV mode will set the aircraft to the air-air or air-ground mode. You can press the button for the selected mode again to put the aircraft back into NAV mode. Drift C/O Switch - the pitch ladder on the HUD is usually aligned so that it is centered on the flight path marker. If the aircraft is in a situation where the nose of the aircraft is pointed in a significantly different direction than the actual flight path (for example, during a steep turn) the pitch ladder could be partially off the display or not visible at all. 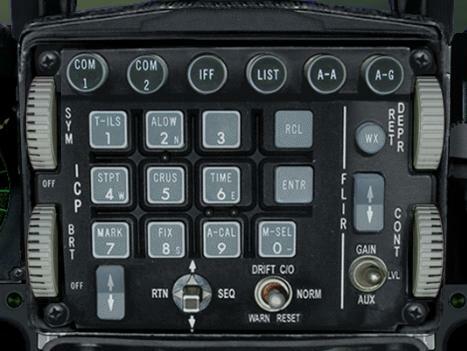 However, if this switch is set to DRIFT C/O, the pitch ladder will always be centered in the HUD, regardless of the position of the flight path. (C/O stands for "cutout" by the way). DCS (data command )Switch - 4 way hat switch below the 8 and 9 keys on the ICP. Described in the DED section. Other controls on the ICP used in conjunction with the Data Entry Display, are described on that page.